Peston: Will euro QE work? On Thursday we get the what and how much of eurozone quantitative easing. Among investors and the media, I've rarely encountered quite so much fevered expectation about a policy that is very unlikely to do more than provide additional painkillers to an economy that needs rather more radical structural treatment (see my post of 14 January). So it might be worth thinking about what QE is supposed to do that could be useful. Well, as Ben Bernanke, the former chairman of the US central bank the Federal Reserve said (and I paraphrase), there isn't a great deal of compelling economic theory around QE, but it seems to work (a bit) in practice. Well when a central bank buys government bonds, it should push up the price of those bonds, which in turn would implicitly reduce the interest rate that the relevant government pays to borrow (the interest rate or yield on the bond falls as the bond price rises). Now since the debt of other borrowers in an economy, such as households and businesses, is priced with reference to the price paid by the government, there is hoped to be - and seems to be - a cut in the borrowing costs for the private sector too. 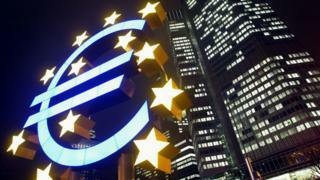 Will QE work in the eurozone - and how would we know if it had? And what's more, if the cash paid for these government bonds to investors and banks is then lent or invested in private sector debt, there should also be a bit more credit available to the private sector. Anyway that is what is supposed to happen. And in practice it did seem to happen in the UK and US, certainly in the early days of QE in 2009 - when there was a good deal of stress in financial markets, and investors were impressed to see central banks with their bottomless purses wading in. So will QE work in the eurozone - and how would we know if it had? Well there is the short term and the long term. It will take some time, weeks or even months to assess whether there has been any impact on the flow of credit or interest rates paid by the private sector. But if there were big market movements on the day - in the price of bonds, shares and the euro - that would tell us something, especially since the market has been briefed to expect QE in some form or other. So if bond and share prices rise very significantly, that would probably mean that the announced form of QE is bigger and more ambitious than expected - and vice versa if they fall. As for the euro, if it were to fall that would mean one of two contradictory things - it could mean that investors expect QE to work by cutting the cost of money in the eurozone, or it could mean QE is a damp squib such that foreigners don't want to own euro assets. Now this is where it all gets a bit surreal and complicated. So buckle up. For the eurozone the symbolism of QE is almost more important than the actual exercise of it. Well the Germans have been arguing for years that QE is illegal in the eurozone, because it is too close for comfort to prohibited direct financing by the central bank of governments, rather than being a tool of monetary policy to manage interest rates. The Germans can however be outvoted on the ECB governing council. Even so, when QE is announced on Thursday, if it turned out that the two German members of council, Sabine Lautenschläger and Jens Weidmann, had voted for it, the markets would be euphoric - because that would imply that the ECB would perhaps be able to operate in future with fewer German-imposed restraints. German assent to quantitative easing would almost certainly see bond and share prices rising sharply. But other things could go wrong for Mario Draghi, the ECB's president. If the maximum size of ECB bond purchases were to be significantly less than the 500bn euros expected, that would not please investors. Most important of all perhaps, if the purchase of government bonds is not by the ECB itself but by the national central banks that collectively stand behind the ECB, that would be a great disappointment to markets - even though there have been plenty of leaks to the effect that such "nationalisation" of bond purchases is likely to be what happens. Why would purchases of Italian bonds by - for example - the Banca d'Italia be deemed as inferior to purchases of Italian bonds by the ECB? Well it would be seen to be an unravelling of the eurozone principle that monetary policy is a shared federal responsibility, not a national one. The point is that - according to economic theory - monetary union can only really work in the long term if its risks and rewards are shared federal risks and rewards, not national ones. So if it emerges that Draghi was only able to secure agreement for QE by devolving its operation to the national central banks, in an attempt to reassure German taxpayers that they are not in any way taking financial risks to support governments other than their own, then many would see that as highly retrograde - a de facto unravelling of monetary union. As it happens, it would also be a fairly pointless and futile gesture to German taxpayers, in the sense that if the worst happened - which is that it looked as though a country like Italy would default on its debts - Germany could never be insulated from the huge losses, even if the Italian bonds were owned by the Italian central bank rather than the European Central Bank. In the case where an Italy or a Spain or (more topically) a Greece were about to renege on what it owed, Germany would either have to stand by when the country left the euro (which would produce eye-watering costs for other eurozone members) or bail that country out. Or to put it another way, Germany is in an "all for one, one for all" monetary union, even if at times it would like to pretend not to be.